Given today’s extraordinary pace of change, any examination of the long-term future quickly brings us to considering the future of humanity. This big-picture view should not just be of interest to us all personally, it is also extremely relevant to organizations of all kinds as they consider their future. 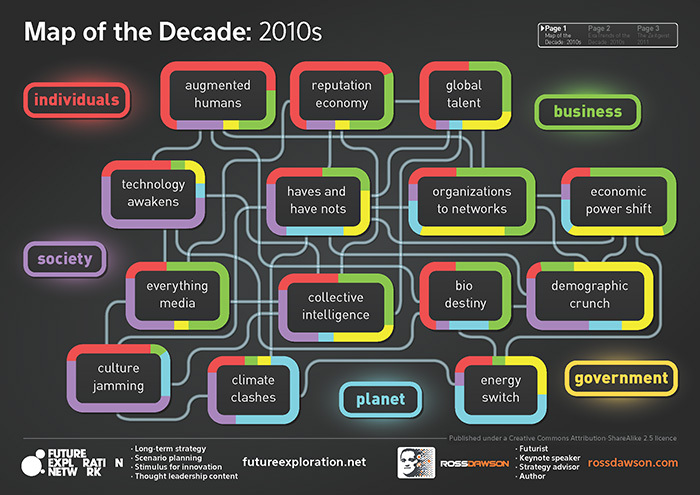 Our Map of the Decade framework provides a high-level overview of major themes shaping our world today. For one of our clients in the global infrastructure industry that wished to look a couple of decades into the future we used scenario planning methodologies to create a framework to support their strategic thinking. Below is a highly simplified framework derived from that project. Availability and real cost of key resources including energy, food, water, and environmental stability. Cohesion of society, government, nations, and institutions. Please get in touch if you’d like to discuss how we can help your organization succeed by gaining insights into the future of humanity.